Though I didn’t get the wedding I may have flippantly been hoping for, I did get a memorable wedding. Weddings symbolize new beginnings. That is what the Orioles are promising with the trade of Manny Machado. A new beginning. A renewed focus on youth, rebuilding the farm system and investing in the international free agent market, which is an area in which they have been inexplicably and comically absent from in recent years. Machado had to be moved. It was inevitable. Dan Duquette had to pull the trigger. Four of the five players that Orioles acquired from the Dodgers for Machado were assigned to AA Bowie. So it was with a sense of great glee that I ventured to Prince George’s Stadium to watch their debut on David Bowie Tribute Night. 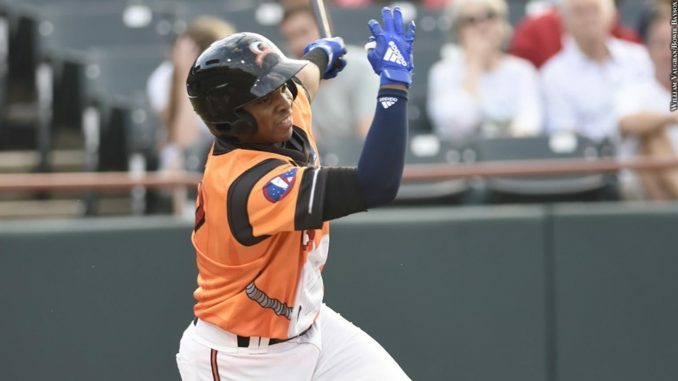 This was the third annual David Bowie (pronounced Bow-E) themed night for the Bowie Baysox (pronounced Boo-E), and I was excited to catch Yusniel Diaz and the rest of the talent the Orioles have assembled in AA. Yusniel Diaz made his debut in right field and batted clean up. Physically, he looks every part of a major leaguer. He has a muscular frame. He has been touted as a hit over power guy, but after seeing him jack two bombs at the Futures Game the week before and getting a closer look at him in this game, one can see how the power will develop. In his first at bat he ripped a single past the shortstop. In his subsequent at bats he was fooled by off speed pitches and his vaunted plate discipline abandoned him. Perhaps he was trying too hard to put on a show for his new home crowd. In the field, Diaz was impressive with both his glove and his arm. He ran down a few balls in the gaps, saving extra base hits, and threw out a runner at home. Diaz has the look and talent of a future major leaguer. It is easy to see why the Orioles coveted him in the Machado deal. On the hill that night for the Baysox was Keegan Akin who is having a fine season, raising his prospect stock in the process. He is a short stocky lefty who is powerfully built. He pitched in the mid 90’s and looked good early on. As the game went on his secondaries got away from him a bit, but it’s clear to see a major league future for the young southpaw. He pitched 6 innings, striking out 3 and limiting hard contact. He allowed one earned run, lowering his era to 2.83. I was glad to finally get a chance to see Ryan Mountcastle play 3rd base. He handled the few chances that were hit his way with relative ease. If he continues to work on his fielding he could stick at the hot corner and eventually be the heir apparent to Machado. His bat continues to be his calling card. He made solid contact at the plate and has shown impressive power and average this year. Zach Pop, acquired from the Dodgers in the Machado deal was noted for his impeccable control. This season in the California League, a notorious hitters league, Pop maintained a 0.33 ERA, while walking only 6 batters in 27 innings. He has a deceptive sidearm delivery that can reach the upper 90’s. He is also known as an extreme ground ball pitcher. Unfortunately, in his AA debut, he struggled mightily, allowing 2 walks, 2 hits, and 3 earned runs. All of this without recording an out. Hopefully this was an aberration or a case of nerves. The Orioles hope he will develop into a useful bullpen piece in coming years. Lead off hitter Ryan McKenna has been on fire in the first half of the season, earning a promotion from single A Frederick to AA Bowie earlier this year. He is breaking out in a similar fashion as Austin Hays did the previous season. McKenna has the look of a prototypical lead off hitter. He worked deep into counts and made pitchers throw extra pitches by fouling off numerous offerings. He demonstrated surprising pop, blasting a home run to left field. He is definitely a player to monitor as he climbs up the organizational ladder. With the Orioles rebuild in its infancy, the next steps need to be considered. Clearly Zach Britton will be moved for prospects. All other players on the major league roster should be available for the right price as well. The Orioles should also look to make a splash in the international market and bring in the top remaining free agent in Cuban Victor Victor Mesa. The Orioles haven’t spent any measurable money of their international allotment and should attempt to add slot money in trades. Mesa would add another high profile prospect to a system that is in the infancy of its rebuilding. Tim says the city is Boo-E in his article. Did you see that?